Boonerism thrives in high schools, where being accepted means conforming to the prescribed uniform, listening to thrash and heavy metal music, and associating with other boons, not yuppies. Booner is a Canberra word that is still heard in the nation’s capital, although there are indications that it is less commonly used now than in the 1990s. It is possible that the rise and popularity of bogan has contributed to this. This entry was posted in ANDC, etymology, regionalism, slang and tagged bevan, bogan, boon, booner, boonerism, chigga, pube, ugboots, westie by Mark Gwynn. Bookmark the permalink. I grew up in Canberra, and remember first seeing the word booner in graffiti in the early 90s. Folk etymology had it that booner was a northside word, and that southsiders used bogan. 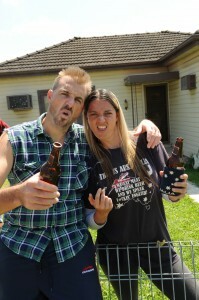 I don’t hear booner in Canberra anymore; it’s all about bogans now. I grew up in Weston Creek (southside) in the 80s/90s and it was always booners. I don’t think I had heard of a bogan until I started university. But I agree that it’s all bogans these days. Thanks for that – it’s interesting to hear that the north—south divide might apply to booner. I learnt the word booner in the early 80s as a kid, and that was in Hughes, so it was definitely in use southside too back then. Kambah High was the worst “Booner” school in Canberra. I first heard “Boon” in Belconnen in around 1982, though.